The article was released the same day when Turkish government detained 15 journalists and board members at Turkey’s leading secular newspaper, Cumhuriyet. What follows is the full text of the Washington Post editorial article. “Little more than a decade ago, Turkey appeared to be an emerging democracy with vibrant civil society and somewhat independent media. No longer. 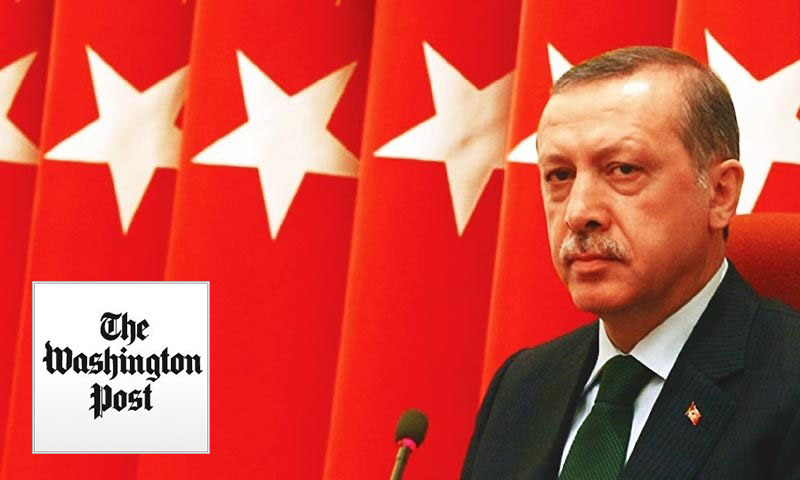 President Recep Tayyip Erdogan has abandoned democracy and is building a strongman cult of personality. The latest descent came Monday when police detained the editor and senior staff of a leading opposition newspaper, Cumhuriyet, one of the few media outlets still critical of Mr. Erdogan. Arrest warrants were issued for about a dozen journalists, of whom seven were taken into custody, including editor in chief Murat Sabuncu. Those targeted also include Can Dundar, the newspaper’s previous editor, now living in exile abroad, as well as several officials in the foundation that owns the newspaper. The arrests are part of a broad media crackdown to silence dissent after a July 15 coup attempt against Mr. Erdogan. On Sunday, 15 media outlets, mostly Kurdish, were closed; by some accounts, as many as 195 have been shut and 140 journalists remain imprisoned. Turkey ranks 151st out of 180 countries on Reporters Without Borders’s World Press Freedom Index, between Tajikistan and Congo. The prosecutor’s office said Cumhuriyet is suspected of supporting Kurdish militants and backing the coup attempt, which Mr. Erdogan has blamed on Fethullah Gulen, a Pennsylvania-based cleric, who denies any involvement. Mr. Erdogan, once an ally of Mr. Gulen, has seemed intent on crushing any remnant of the Gulen movement in Turkey. But that cannot explain the move against Cumhuriyet, which has been critical of Mr. Gulen and his movement for years. Rather, Mr. Erdogan is constructing a kind of authoritarianism centered on his personal power, replacing critical media with mouthpiece organs, suffocating independent civil society organizations and summarily dismissing thousands of academics without due process. Overall, more than 110,000 people have been sacked or suspended and 37,000 arrested since the coup attempt; just over the weekend, 10,000 more civil servants were dismissed. This is a colossal purge, tearing the heart out of any remaining hope for a democracy that depends on independent voices and unfettered political competition.